Overseas based Guyanese, Franco Crawford, who was a member of the Flying Ace Cycling Club before migrating to England, has once again extended his benevolence to the sporting fraternity. 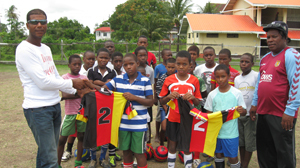 Franco Crawford (left) presents the footballs and T-shirts to members of the HOMFC camp. Crawford, who is back home on holiday, on Monday visited the Hearts of Oak Masters Football Club Annual Football Camp, which is being held at the All Saints Scott Church Ground, and apart from giving a pep talk also presented the organizers with some T-Shirts and footballs which are to be used during and after the activity. He congratulated them for taking the initiative to organise the camp which he stated is a good thing that will keep the youths occupied and away from the many social ills and illicit activities that are plaguing the country. Camp Coordinator Neil ‘Grizzly’ Humphrey expressed gratitude to Crawford for his assistance. He urged others not to forget where they came from and to take a page out of ‘Franco’s book by assisting in whatever way possible.